Registration is $20, extra hand $10. Lunch stop at Porky's. In addition to prizes for Best Hand, 2nd Best Hand, Worst Hand, there will be door prizes, a 50/50 along with a live band and pizza at the end of the ride. 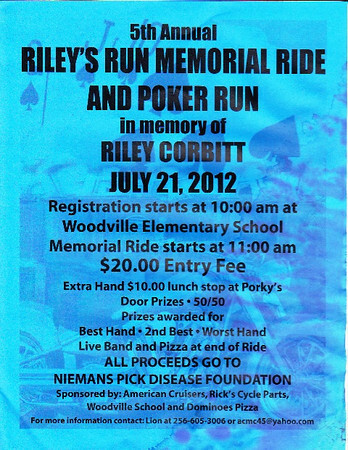 All proceeds to go Niemans Pick Disease Foundation. End time is just a guess.